After publishing my previous article, I realized my next blog post (this article) would be number 1,000, which is pretty insane! It has been an amazing 8 years of sharing and engaging with the VMware community and I just want to thank everyone that has supported me over the years. Earlier this year, I had put together a Python script using the vSAN Management API to help customers easily identify Virtual Machines which have Thick VM swap while running on vSAN. You can find the full details in Duncan's blog post here. The reason I had chosen Python over something like PowerCLI, which I frequently use now, is that I had found a bug within the Storage PowerCLI module which prevented me from accessing the required vSAN Management API. With the release of PowerCLI 6.5.4 today, this issue has now been resolved and I have created the equivalent PowerCLI script called VSANVMThickSwap.ps1 which includes a function called Get-VSANVMThickSwap to retrieve the exact same information as the Python script. To use the function, you simply pass in the name of a vSAN Cluster as shown in the screenshot below and the script will return all powered on VMs that have been configured with Thick VM Swap. I had been in meetings all day today and I had noticed my Twitter notifications was going nuts. It was only until my last meeting of the day, which was with Emad, did I learn what was going on. I had no idea the Top vBlog 2017 results were being announced today and when Emad broke the news that I had gotten #1 this year, I was left speechless. I want to thank everyone who voted for me, this recognition truly means a lot coming from the community, so thank you! 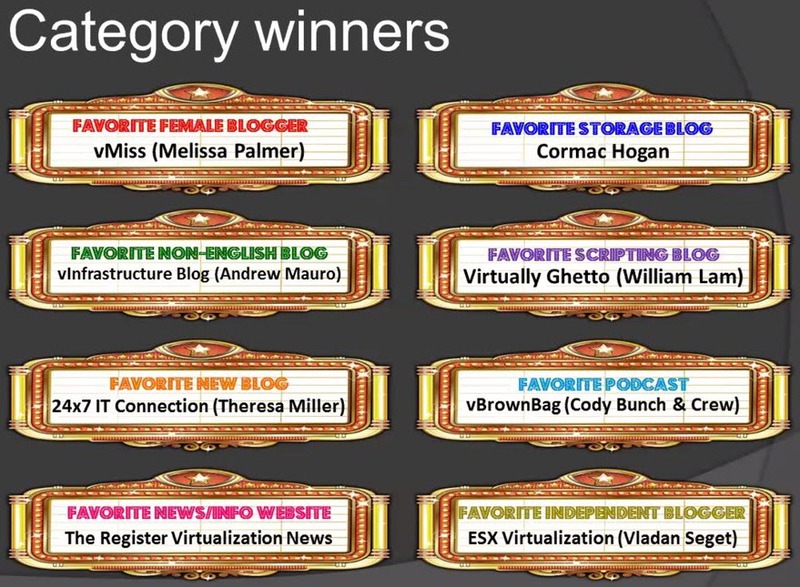 I also want to congratulate all my fellow bloggers who were also recognized in this years Top vBlog including the special category winners. Lastly, a huge shoutout to Eric Siebert for running the Top vBlog program and spending countless hours putting everything together, we know its not easy each year and the community really appreciates it. Of course, I could not leave out Eric Wright and Turbonomic who were the sponsors again for this years Top vBlog. Thanks for guys! If you missed the live-stream earlier (like me), you can watch the full results below. I believe Eric will also be publishing the complete Top vBlog results on his blog soon, so stay tuned for that! The other day, I had a customer ask about the latest version of the Ports and Protocols document that was put together by the VMware Validated Design (VVD) team which does a fantastic job of outlining all the connectivity between the products used within the VVD SDDC. It actually took me awhile to find after realizing it was posted on the VMTN Community rather than the official documentation page. 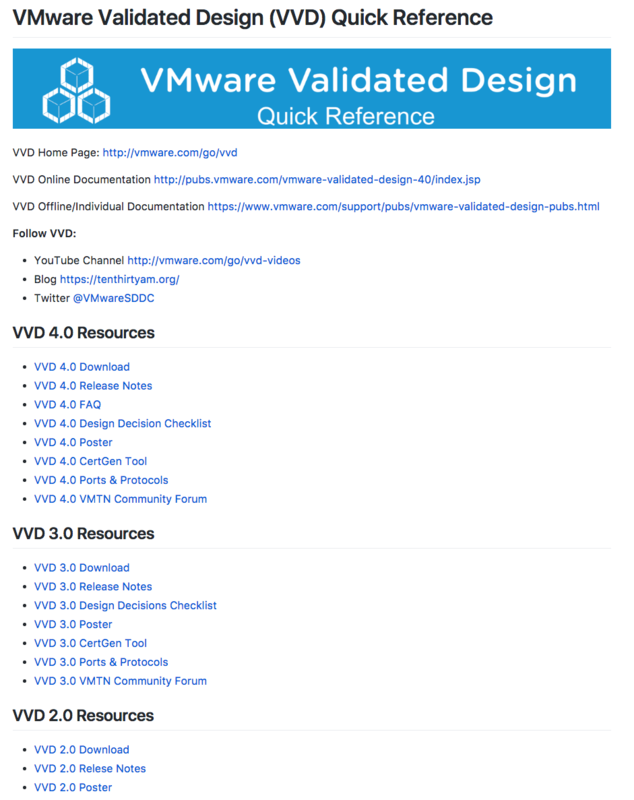 I also came across other VVD content that I thought would also be useful for customers and decided to create a VVD "Quick Reference" that organizes all of this content into a single place. In addition, I also created a nice short URL to the quick reference so you only have to remember that. 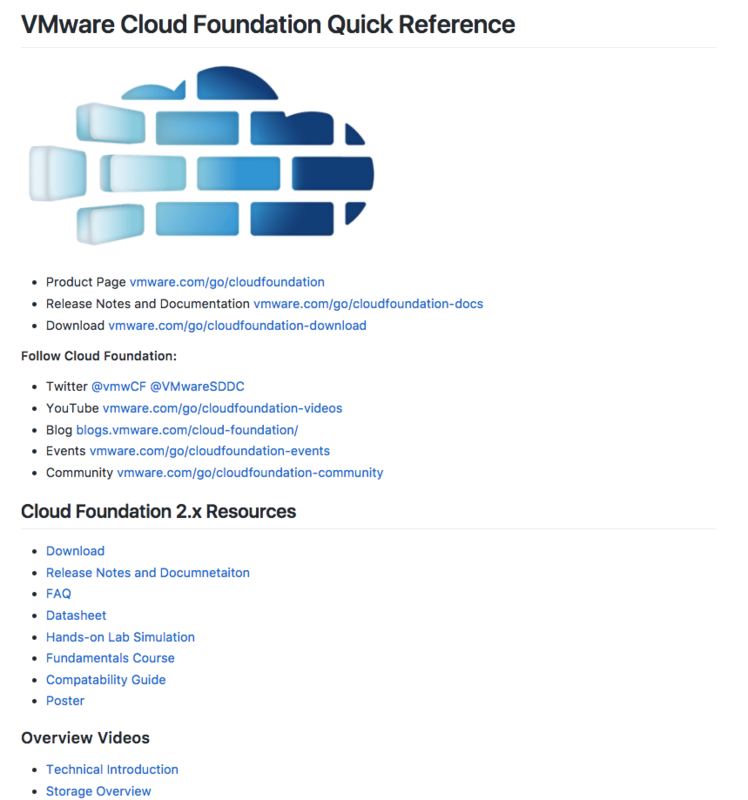 After sharing this on Twitter yesterday, Ryan Johnson (TMM for VVD/VCF) got inspired and also created VMware Cloud Foundation Quick Reference which I also built a short URL for. 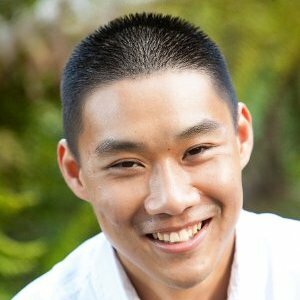 If there is other content that you would like to see, feel free to drop me or Ryan a comment or better yet, submit a pull request on the Github page!